Stories about living on the farm training dogs and horses. Oh Hey! Ya, you! I know, I know... It's been a LONG time... I've been busy. Things change. Biggest change. I'm a momma to an animal loving baby girl. Next biggest changes - animals have gone, and animals have come. I still have Ryder and Diva. They are proving to be shockingly good with the baby girl. I jokingly call Diva "Dog Mom". Whiskey was laid to rest in the "back 40". It was time and I felt such a release of stress upon making the decision. Marnie or "M" has been a frequent flyer at the vets after a failed attempt at breeding, followed by a severe infection, followed by an AI attempt this year. M will be foaling June 2017. Johnny - he came and now he's going... I took him in trade after being on the wrong end of a shady horse deal. The mare that I traded for him went back to being a broodmare. Now, with time being an issue and wanting to spend my money elsewhere he is up for sale and tentatively sold. That ability to take what life brings and recognize, embrace it for what it is. This has been the summer of acceptance for me. This has not come without its bumps and bruises. I had made a number of goals and statements earlier in the year. And life happened. While I had wanted to work the dogs every day. This just didn't happen. You see, in June, I had "all day sickness" not just "morning sickness". It literally was all I could do to get through my work day and work commitments. This meant the dogs were not ready for the summer competitions. And that, quite frankly, depressed me. A couple of weeks ago I hauled the dogs two hours down the rode to take a lesson with another trainer. We talked about aspirations for them. Mine of course. I have accepted that Ryder wants to be an agility dog. I won't force the stock work on him and will renew my focus on taking agility classes. Diva. I'll do my best to get her trained and maybe try her at some field competitions next year. Realistically, in a year or so I'll be looking at buying a trained stock dog. I just won't have the time to train a pup into a working dog. I have accepted that my dogs are basically well loved pets. I won't lie. I tear up and cry whenever I think of Whiskey. This has been the hardest thing for me to accept. I LOVE this horse. I love her eye. I love her attitude. I love her sweetness and kind spirit. But love isn't going to fix her. My dad's diligence has really improved her mobility. So when I went out last week to meet the farrier I was stunned to see her hobbling around. With no physical evidence of an abscess or bruise it meant it was just normal navicular issues. I went home absolutely torn. If she was that lame on a lovely summer day, what would happen in the winter? I've begun to seriously consider if lame equates to pain. Is she truly so stoic that she doesn't demonstrate any traditional signs of distress? She is unequivocally lame. No debate. But she doesn't show signs of pain. I've worked with lots of injured horses and know they generally display some behaviour and physical signs when they hurt. So I flip - flopped. Is lame the same as pain? When is the right time to say goodbye? I would rather euthanize her too soon than reach an emergency situation and be too late. My friends say she'll tell me when she's ready. The problem is I don't know. Has she? Has she told me and I just haven't been listening? A large part of me knows that leaving her is more for me than her. Am I being selfish? Within the next few weeks I'll make a final decision, but I'm leaning towards letting her go. I've found out that a person can get them cremated. This means I'll pack her ashes, just like I pack Tessa's until I can find a place where I feel right about leaving them. For now, I can't bear to say a final good bye. Over the last few months I've felt like I've been chasing pink unicorns. I have felt like an unmitigated failure where the dogs are concerned. This spring I had decided I was going to take a run at trialling them this summer. In order to get to that point I would need to be working them everyday. That hasn't happened. As it stands I feel like we're treading water. They have not made significant progress. They have also not been worked every day. Sometimes I feel I did them a disservice by not sending them out. If I had sent them out would they be trial worthy stock dogs? Is it too late for them? Have I buggered them up beyond repair? A friend said something tonight that struck a chord. She asked who I liked more as a dog. These guys or Tessa. Yikes! It was Tess hands down. And it made me think. Is part of my problem that fact that these two aren't Tess, will never be Tess, and can never be Tess? I've been tossing around the idea of a pup. Crazy I know. I've contemplated picking a pup with good lineage from trial lines and trying again. Keeping these two as pups. But the good lineage thing has not worked for me. Tessa had quite unremarkable breeding. Ryder and Diva have a bunch of champions in their pedigree. And both dogs have some pretty hefty faults when it comes to training on stock. Diva is far too willful. While the more talented of the two she locks onto the sheep and ignores me. Ryder is far too soft and weak. He lacks confidence, can't handle tough sheep (won't work cows) and can't handle the training necessary to become a trial dog. After all, he needs to take a certain amount of correction to improve. And he doesn't. This is a challenge I don't know if he'll ever overcome. He does far better with fun time agility. It leaves me in limbo. I kinda don't know what to do. What direction to go. I've scheduled another round of agility classes for both dogs. Either way I feel like a failure. Something I tried so hard to do "right" has gone so wrong. Am I still chasing Pink Unicorns? Some days I seriously question my wisdom. Literally in the space of weeks I went from two horses to a quickly multiplying herd. I had been looking casually for a kids horse for quite some time. 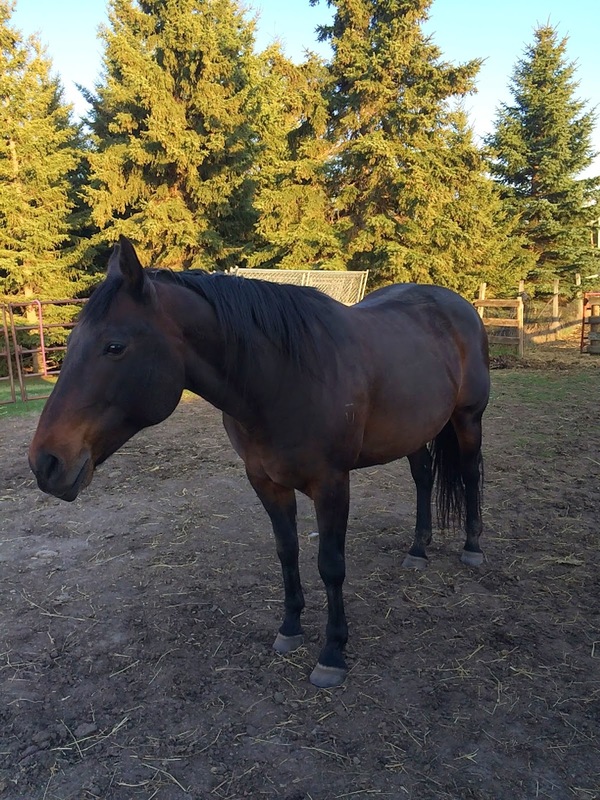 When Sweetie became available it seemed like the right horse for the right price. So I jumped. She comes home at some point in August when her foal is weaned. Then came the Whiskey saga. The knowledge that she had Navicular and had it to the extreme that breeding her wasn't going to be an option sent me into a tailspin. The truly funny thing is I thought I had accepted that fact that she was going be a "downer". Nope. Clearly not. It's extra hard because due to my dad's impeccable care she's actually improving. She is demonstrably less lame. I began the pedigree research. Trying to find another Whiskey. Nope. No such luck. What I did find were some distant relatives. Thinking that was my only option I began process of looking towards purchasing something along those lines. And then I stumbled across this gem. 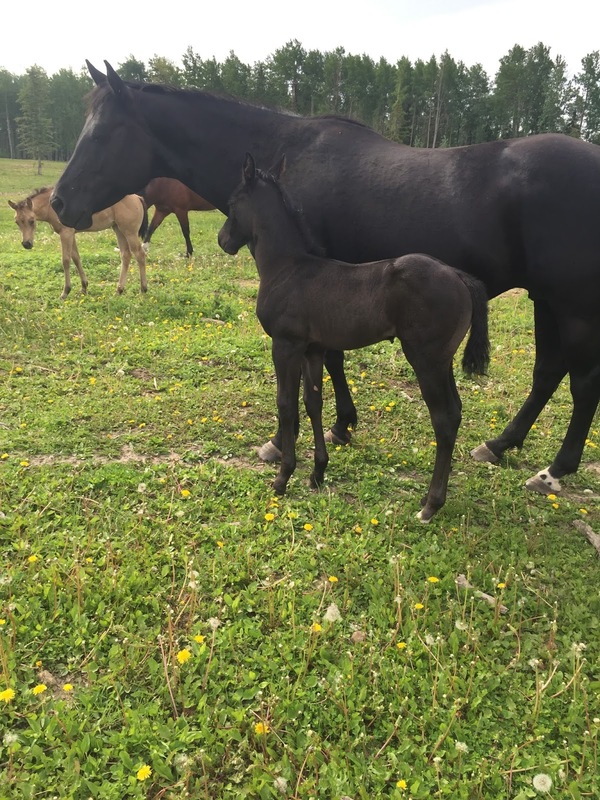 This black mare is Whiskey's 1/2 sister (dam side). Initially thinking I'd get the mare with a 3 in 1 option I began negotiating. Then, deciding I was completely crazy, I decided there would be waaaaay too many horses. So I bought the foal. 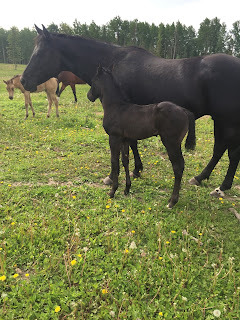 The black filly will come home to me in the fall. I can't wait. This little girl needs a barn name and a papered name. (I've asked to do the paperwork.) Here is her pedigree. It's not overly fancy, but that's not why I'm bringing her home. So here's the summer tally. Whiskey - undetermined what will happen with her. If she continues to improve, and is happy and comfortable - who knows how long she'll be around. Marnie - off getting bred to Pegasus. Sweetie - arriving in August. No Name - arriving in the fall. I'd like to point out that brings my horse total from 2 to 5. Just say'n! I had one of those weeks. Where my inner Horse Hoarder ran rampant. I just could not let go of the conversation I had with my farrier when he said Whiskey should have one last baby. It haunted me. Whispering in my ear. I fell over the edge when I went out to work the dogs and Whiskey was so incredibly lovely. I became obsessed. Stallion research commenced. The vet was phoned and her x-rays were sent to my farrier to review. I told him I needed his professional opinion. Would she handle being able to carry one more foal.? In the days it took for him to respond I blew through $30 of AQHA records, and narrowed down a stallion choice. My farrier responded with his first negative comment about Whiskey. After reviewing the x-rays he felt breeding would cause major trauma and break down. Not being able to breed her safely and comfortably means no baby. Based on his reaction I realized her days were a lot more numbered than I thought. My obsessive behaviour reached epic proportions. I sent email after email, message after message, desperate to find relatives to her. I begged to buy back her filly. I just could not imagine a world without her. Without carrying on her genetic stamp. Trust me. I get it. Her breeding isn't remarkable. It's not trendy and it's not full of performance earners. What it is is full of history. Full of horses with athletic ability and outstanding dispositions. Those horses have been proven in an entirely different way. It was somewhat surprising to discover these horses hadn't been overbred. Whiskey's mom had four foals. Her sire had five. Granted she was the last of the lot. Sold off as a two year old during a dispersal sale. One of my many emails reached gold. The lady who owned Whiskey's dam had bought a number of Bar U horses. Tonight we had a lovely conversation. It was fun talking with someone who knew the history. Who had actually tried to buy Whiskey as a yearling - owner refused to sell - and loved these horses as much as I do. So, my hoarder tendencies are still in fine form. I may have... done something crazy... and made a tentative agreement to buy a yearling. From the Bar U lines. I'd like to go look this July. If she looks good, I'll buy. The current owner is a little quirky. She's mailing me copies of papers and pictures of the filly. But that's okay. Officially buy "Paint Me Sweetly". I will take possession of her in August when her current baby is weaned. Debate breeding her even though I buy her to ride. Take Marnie to Fleetwood Farms to breed to Pegasus. I may have had a meltdown or ten debating who to breed her to once she arrived there. See babies related to Whiskey - have the most intense breed her pangs. Remain undecided on that issue. See? I really am a hoarder. It all became clear today. As I scrolled through the horse ads a flashy Arabian caught my eye. My fingers stilled. I clicked. Opened it up. And thought. I gasped. I was a hoarder!! I can't help myself I keep wanting to ADD to my herd. I keep wanting to ADD saddles to my collection. I have a problem! Back to the Arab. Wouldn't it be cool to have a really nice Arabian cross to rein on? To compete in Working Cow Horse? A person could show in the open shows as well as make a run at the breed shows? Remember I grew up riding Arabian. I have a deep and abiding love of the breed. The next ad that stills the fingers is a lovely OTTB (off track thoroughbred). I imagine this horse recycled. Recycled into a hunter/jumper training program. I love the idea of creating a second life for a horse. It bothers me greatly how many of these lovely horses become disposable once their race career or failure to launch race career come to a close. I am loving the jumping. It's fun. It's challenging. It's making me a better rider. And then I see it. The stunning quarter horse colt. Stallion prospect. Fancy reining breeding. Oooh - how neat would it be to raise, train and show a top end reiner. Uh oh! Did you see that great deal on the cutter?? I love horses. I love the possibilities in a horse. I love breeding something and seeing the potential. I love the research into pedigree. I love handling and working with a young project. It's the same reason I want a new cutting saddle. A reining saddle. A rope saddle. I just can't help myself.